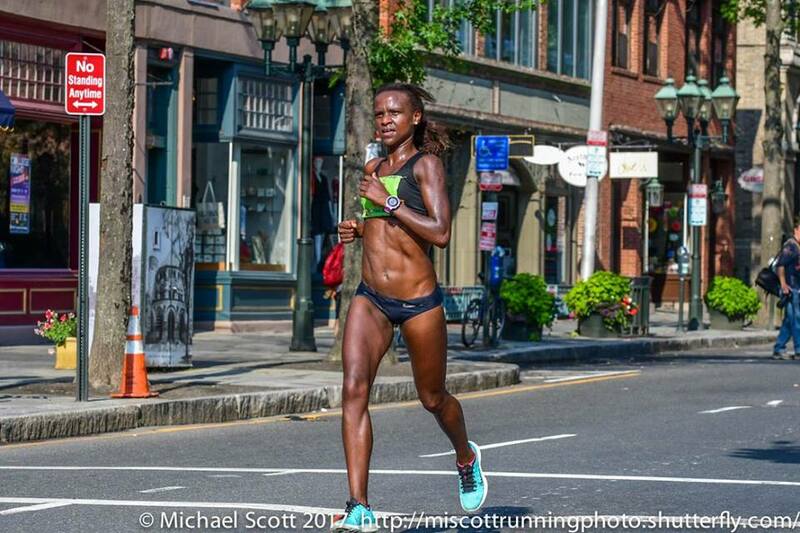 While most of the Elite Team was off in Acushnet, MA on Labor Day, Obsie Birru was continuing a sensational summer racing season in New Haven, Connecticut at the USATF 20k Championships. The Annual Faxon Law New Haven Road Race has served as the host race for the USATF 20k Championships every year since the USATF Running Circuit began in 2002. The race typically features a star-studded cast of American distance runners, many of whom are looking to test themselves a month or so out from big fall marathons such as Chicago, and this year was no different. The entry list was peppered with national champions and world-class marathoners, including Sara Hall, reigning champion Aliphine Tuliamuk, and eventual winner Jordan Hasay. Despite having only just arrived in Providence a few short weeks ago – the drive from Des Moines having taken a grueling 23 hours to complete – Obsie was excited to compete for the first time as member of the NE Distance Elite Team and to test herself against our nation’s best. Leaning heavily on her great summer fitness and her vast experience competing on the USATF Running Circuit, Obsie ran a gritty race to finish 19th overall in the Elite Women’s field in a time of 1:13:59 – 5:58 pace for the approximately 12.4 mile race! Afterwards we sat down with Obsie to hear how the race played out and also how she is settling into her new life here in Rhode Island! Tell us about the race. Did you have a specific plan going into it or was the goal to just get out there and compete? I usually try to keep my racing strategies very simple as I feel like running is beautiful in its purest form. It’s good to have plan sometimes, but it’s also good sometimes to throw everything else aside and just compete, so that was my goal. I knew I wasn’t in the greatest of shape as I’m just coming back into workouts with the move and everything, so I just wanted to compete. One of the perks of running an obscure race distance for the first time is that you get an automatic PR, so congratulations on your 20k PR of 1:13:59! How did you like the 20k distance? I thought the 20k was a fun event! Running it was a good way to shake things up from running half marathons or 10ks. It’s fun to experience a new distance and do something you haven’t done before. How does last Monday’s race help you moving forward with your season? What is the most important thing you learned or will take away from your performance? I pride myself on learning both a running lesson as well as a life lesson in every race that I run. I think it’s important to not only grow as runner but also as person. Monday’s race was such good reminder for me that it’s easy to get caught up in other people’s racing strategies. Sometimes you go out with the front pack at the beginning and you feel good, but when you’re suffering like 4 miles into the race, you realize you made a mistake. I feel like in the future I could be a little more self aware of that, of making sure I run my race early on. I also think that simply learning to run at a faster pace and running with group with help as well. The life lesson I took away from this race was more of an affirmation than a lesson, but it was the fact that kindness and simple thank yous can go long ways! I think as we get older and as life gets a little overwhelming it’s easy to overlook the little things that make a big difference, such as being a good friend and good human being all around. Yes, this was a national championship – one of the biggest stages for running – but it was also an opportunity to spend time with many of my friends who are not only great runners, but great people too. This race was also an important opportunity to acknowledge all the people that have helped me get to this level: my parents, teachers, and coaches who spend time away from their family to make sure I can be my very best. What was your favorite part of the event – either during the race itself or sometime during the event weekend as a whole? I had so many great moments it’s hard to pick! There were many great moments spent with friends, race organizers, and all the other people who work so hard to make sure we have all we need to run at our best. My favorite moment came at the finish line when I encountered a child about 5 years of age who was standing with his mom. He looked at my medal like it was the greatest thing ever, so I gave it to him, which I could see just made his whole day! At the finish line of most of my races I make a point to always make an eye contract with child and make sure that I give them high five or my medal. To me, that’s my way of sharing the the gift of running. Running is about community. It’s about finding joy and friendship in our suffering together. It’s about showing each other kindness. As adults, we sometimes get so caught up that we forget those little things, but children are amazing reminders that you must always have joy. That little boy helped me to stop having self pity about my less than perfect race, and allowed me to be thankful for everyone who came out to support us and be inspired. You’ve been to a number of USATF Championship Races over the last few years. What was it like to compete at this one as an official member of NE Distance for the first time? It’s a great feeling to be part of a team again! I think my definition of being part of a team is different than a lot of other people because I was fortunate enough to have a team that was like a family in college. My college coach, Seth Roberso, used to have this saying that I love: “it’s family because I care, I care because it’s family”. When I was speaking to NE Distance about the possibility of joining, one of the biggest things for me was having that family-like group. When I came out for my visit, I loved being around the team and seeing how they supported and cared for each other. I like to refer to the team as my “Running family” because to me at the end of the day that is what it is, a group people who care about each other. We are a family that works together and pushes each other to achieve greatness. Make no mistake, I came out here to be the best runner I can be, but at end of the day. I also want to grow as person. If I didn’t feel that was possible as a member of this team, I wouldn’t be here, but it was very clear from the beginning that the coaches and athletes on this team are highly committed to that. You made the trip from Des Moines to Providence just a few weeks ago. How has that transition been? Are you starting to feel settled in your new apartment and city? The transition from Des Moines to Providence is going well. It’s actually going much better than I expected, and for that I am forever grateful to the people on this team. I feel like our teammates who have been here longer have really tired to make sure that all the new athletes are comfortable with everything. Again, it’s the little things that have made a big difference, like just helping each other out in every day life situations. I feel like the veterans on the team have really done everything that they could to make us feel right at home, and for that I’m really grateful. I also feel really lucky to be living with two other new teammates who are positive and open to figuring things out together!